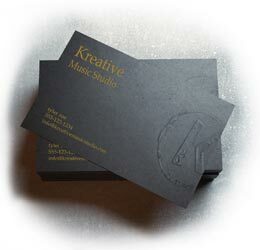 Embossed business cards are an ideal way for you to bring attention to the message you want to convey. Being forgettable is not an option in today's competitive business environment. Custom business cards that utilize embossing stand out, and add a dimension of sophistication to your image. The process known as embossing utilizes two opposite etched metal dies (usually composed of copper, magnesium or brass) and heat. These elements push/raise the graphic or text above the surface of a sheet of paper to create a three-dimensional, eye-popping effect. A reversed image of the design is used to make the embossing die. If the design is indented rather than raised, it is called debossing. You have probably seen or felt the raised surface of a notary seal; this is embossing. Business cards can be blind embossed, which is simply an imprint without ink or foil applied. Embossing with foil or color on the imprint adds another visually appealing and distinctive element to your business card. Custom printing is our specialty for a reason. Quality business cards that leave an impression give you more impact for your dollar. Grabbing the attention of potential clients and driving attention to your brand are essential to success, and embossing is an elegant way to market your business message, making it memorable. Considering how many business cards your potential customers get each day and at trade shows and conventions, this custom effect can make all the difference in getting noticed. Embossed business cards make that lasting impression and are a great choice when considering business card ideas that yield results! We thought you'd never ask. We are happy to provide examples of the quality and creativity PrintingForLess.com is known for. Take a look at these great ideas for embossed business cards. Need a physical sample? Request Samples, call 800-­930-2423 or email us now! Can I get an idea of cost? Sure! We have a large selection of paper, finishes, and custom options so we will provide some basic pricing information for your consideration. To get a custom business card quote that includes embossing, simply call 800-­930-2423 to talk to one of our friendly printing experts, or Request a Quote. Even in our digital world, business cards are an expected part of networking. Forget to bring them and you'll be scribbling your name on scraps of paper - and looking pretty unprofessional. Embossing makes standard business cards feel and look different, enhancing your image and increasing the chance that you'll get a follow up call. Business cards are most effective when they convey your most important information at a glance. Don't clutter them up with details, but do include your key information. Also consider including your photo. People remember faces more easily than names. A photo on your card will help people recall their conversation with you, long after the convention, tradeshow or networking event is over. The overall look of your business cards should help promote your personal or business brand. Use the same colors as in your logo and other promotional materials. Then use embossing to suggest the qualities that make your business special. Clever use of embossing can show creativity on a designer's cards. Used for a law firm logo, it indicates an established and respected business. And when combined with foil stamping, embossing makes your name the center of attention. 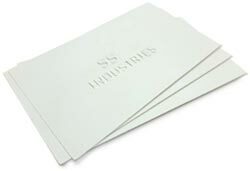 Embossed business cards also make elegant hang tags for clothing. They give off an air of quality when you tuck them in with internet orders. Use embossing to encourage repeat business by creating an embossed business card coupon that you attach to receipts. Embossing is an old technology that breathes new life into business cards. Use it to create unique textures that will help people remember you long after that first handshake. Need advice on adding embossing on your business cards?